The only thing more thrilling than witnessing your favorite Major Leaguer hitting his 500th Home Run is being the lucky fan who caught that magical ball. 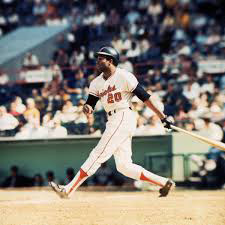 Especially if it’s “on the fly,” like the Frank Robinson’s 500th homer, which I was lucky enough to catch. You’d think a kid growing up only three miles from Memorial Stadium would have gotten lots of foul balls. After all, I went to a bunch of games. And once a kid in my neighborhood got five balls at one game. Actually, it wasn’t until I moved away to college that I finally caught my first ball. I guess I’ll always remember September 13, 1971. During third period class that day, I asked Bob Mueller if the O’s were in town (Bob knew everything about every Oriole. He said the Orioles were playing a double-header against Detroit. Before the bell rang, we had a carload anxious to start out for 33rd Street. There were six of us – four Baltimoreans, a Red Sox fan from Worcester, MA, and a Pirate fan from Altoona, PA (it was a liberal arts college). 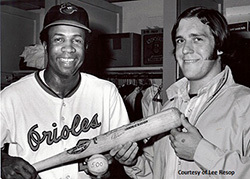 On the way, we heard on the radio that Frank Robinson had hit his 499th home run. We were all excited that we might be at the game in which Frank Robinson hit his 500th home run. 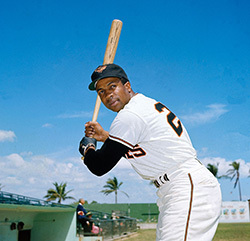 During the game, each time he got up everyone chanted, “Hit it now!” But it wasn’t until the ninth inning of the second game, after Curt Motton and the “Booger” got hits, that Frank did it. Since it was almost midnight and Detroit was killing us, most had already left the ballpark – especially since it looked like Frank would not get up in the ninth. We all went crazy, screaming and jumping all about. Suddenly, two ushers grabbed me and said, “Come with us.” Before I knew it, I was whisked away to some small office with my friends waiting outside. Before I knew it, I was getting my picture taken with Frank Robinson and being interviewed by Channel 2’s Jack Dawson. Of course, I said something inane like, “Yeah, I caught it on the fly.” This 21-year-old felt like a six-year-old kid. And why not? It had just caught my first ball. OK, so I had to give it back. But I did get another ball and one of Frank’s bats. What you were thinking when he hit the ball? Actually, we (my 5 college buddies and myself) were just excited about possibly being at the game that he may hit his 500 home run. We had just moved over 5 sections to the left field home run pole when he came up in the ninth inning, thinking if he did hit it, maybe we would be near it. Everyone was chanting, "HIT IT NOW!" Honestly, I had no idea that I would be near it, much less catch it. What you were thinking when you caught the ball? Once he hit it, it looked as Frank described it, "like a parachute" and it floated down into my hands. After some 15 years of going to games, it was the first time I got a ball. I thought that it would sting my hands, but it didn't. My whole body was numb with joy. What it was like to be in the stands with Oriole fans after you claimed the ball? My friends and I, plus the other fans in the section, were all jumping up and down, screaming like little kids, but in slow motion and without any sound. It was awesome. Then two ushers approached me, grabbed me by my arm, saying, "Hold on to the ball" and "Come with us". They took me down to a small room next to the Orioles the locker room. After waiting for what seemed an eternity, an Oriole executive (a guy with a suit) came in and said, "Frank would like the ball." To which I gave my infamous one word reply, "Sure." What it was like to meet Frank and present him with this ball (which obviously meant a lot to him)? Once I was escorted from the small room to the Orioles locker room, it was all a blur. Seeing Orioles walking around laughing and joking was unbelievable. I saw Brooks, Boog, and the whole team. I tell friends later that I think I saw big Boog Powell wearing nothing but flip-flops and a towel and that it may scar me for life. (Dumb joke.) Actually, there were local TV Sports folks there and I had a quick 2 minute interview with Sport reporter, Jack Dawson (WMAR-TV). I have no idea what I said. Then, they took a picture of Frank and me with the bat and another ball. He didn't want to write anything on the actual ball, so someone handed him another ball with the number "500". The Orioles' executive took my address information and said that they would be contacting me about four free tickets to a game soon. I asked for six tickets, because there were six of us, and they did give me 6 tickets to a game. I think it was 2 or 3 days later. The SEATS were awesome, right down next to the Orioles dugout. In the fifth inning or so, they announced Frank's feat over the PA system saying something like, "... and here is the young man who caught the ball and returned it to Frank, Leo Resop". I stood up and waved. My buddies mocked me all night after that. Actually, everyone at school teased me for the rest of the school year. But, it was a good tease. How/when have you stayed in touch with Frank since 1971? Actually, I have never met Frank since that day. Prior to the 20th anniversary of that day, my wife called the Orioles (without my knowing it) to see if I could throw out the ball, but they said they picked out those folks out months in advance. Once when he was the O's manager (around 1990) I went to O's autograph day with my son, but ended up in the wrong line. We got Curt Shilling instead. Bummer. Recently, after Frank was named manager of nearby Washington Nationals, my son pestered me about trying to see Frank to have him resign the bat which has worn off over the years. But I never did.